Aunie Sauce: It's not just words on a page. but let me just say thank you. I was blown away by your sincere, sweet, and heartfelt comments on yesterday's post. without fail—you're there to support me. I love blogging—it's an outlet. But it's also a place for fellowship. A place to minister, to listen, to share. The love I felt yesterday is a feeling like no other. Thank you for making my heart full. she's actually the epitome of a "saucy" girl. She writes what she thinks—no filter. And I really appreciate her for that. So please, take a moment to relax and enjoy the Bonnie Sauce. The name is Bonnie Blackburn Larsen and writing nonsense is my game. Sometimes I get in trouble for what I write, but that's just the way the cookie crumbles. The husband's name is Greg and I've been told I would be a fool for letting the internet Gods know my husband's name because now they can steal our identities and invade our home, GASP! Therefore, to protect us from cyber devils and because it seems somehow hip I have named him Hubs. I pride myself on originality. This is me in my very sexiest form. I look like this about 0.0021% of my life. Maybe less. ﻿This is me in my ugliest form- dressed up as Voldemort for midnight Harry Potter premieres. I just felt like from the get go you needed to know me in my best and worst forms. Just know that usually I am somewhere in the middle of those two extremities, but creeping over more into the Voldemort side, no doubt. If you are still interested in me, (oh this sounds so romantic!) you have a couple of options from here. Option #1: Continue reading this post on Aunie's blog where I will talk about risky writing and how somehow we have to write the stuff that is hard to write even though people might hate us for it, we must write it, dang it! Option #2: Visit my blog where you may read all my rambling to your heart's content. You might wanna check out this post which will give you a very personal, loving tour of the blog and a guide to the greatest posts- the romantic ones about my Hub-a-dubs, the ones about teaching high school to bratty teenagers, and even the scandalous ones. Option #3: While at my blog, enter yesterday's giveaway- the absolutely biggest giveaway I have ever done in the blog's history! These thoughts have been spurred on by this post that my blog buddy, Taylor wrote about the recent elections. Taylor, however, seemed a bit alarmed. People were demanding Taylor's head. To win her readers back over, Taylor dedicated her next post to her "softer" side- trying desperately to convince internet meanies that she's not the crazy, sarcastic b%&#* that she pretends to be. Secondly, I wanted to somehow sit down with Taylor in a coffee shop and tell her that what she was doing was spot on. Of course I couldn't because I live in Utah and Taylor lives in Chicago and I don't drink coffee, but that's a whole different discussion, isn't it? But what I wish I could somehow relate to her was that it was good if people disagreed and people said mean things. Heck, it was even good if she lost followers over it. In May I sponsored a blogger who politey asked me three times to rewrite my post. My posts were too "controversial", "polarizing", and "inappropriate" for her blog. I had links to a post on birth control, a post about my students' threats to Justin Beiber, and of course, my favorite post describing my high school student who confused whores with horse. The blogger stated that she didn't want her blog to be a place where these "kinds of things are hashed out." While I, of course, respected that blogger's wishes, I was also surprised and a bit saddened that she didn't want anything on her blog that could spark the least bit of controversy. Where was the fun? Where was the spark? Where was the risk? Good writing does not succeed or fail based on its ability to please. Good writing succeeds or fails based on its ability to engage. And if I've got 66 people yelling at me for parking handicapped, well, by golly, I guess I engaged them. Now come over to my blog and add your two cents! Do you think bloggers should write about things that scare them or keep it to sweet, non-controversial posts? 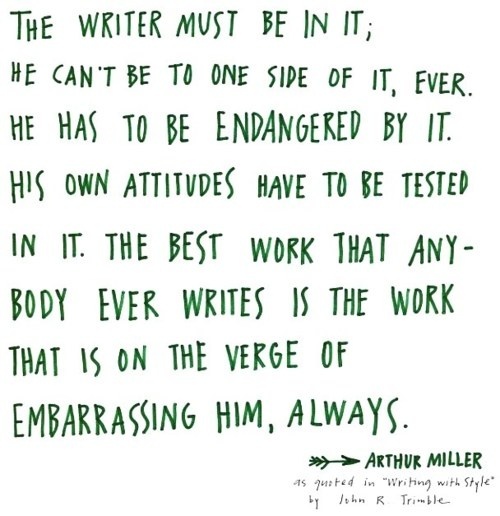 Do you take risks with your writing? What are your favorite type of blog posts? Thanks for sharing your thoughts on writing to produce thoughts, conflict, and conversation. I wrote for my college newspaper, and we tried to do that with our issues. But, I haven't written a lot of controversial posts...a few though. I'm definitely reading the posts she linked to at the end! I love blogging. It really is the best outlet! Aunie,you're pretty much awesome. For real. And everything you wrote is why I love blogging so much. It's an awesome community, right? Bonnie, I love love what you wrote about writing. And scary writing is pretty awesome... sure, you get the people that don't agree with you and so they freak out. Kind of lame. But I love when I can read someone's writing and even if I don't necessarily agree with them it can spark an amazing discussion. The cool thing about this world is learning from each other's differences. I really needed to hear this. I'm always a little worried about offending anyone... especially over religion and politics, which is why I never share my opinions on the blog. I kind of like it that way but at the same time I find myself attracted to the controversial posts and wish I had the guts to say what I really mean. This is so inspiring!! loved this post so much! thank you for inspiring me to be open!